Explore electric, gas-powered, tank and tankless Ruud hot water heaters, and save energy, money and time when buying high efficiency, condensing models or solar models. 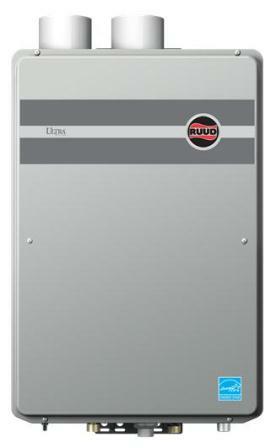 Ruud/Rheem is the North American leader in water heating industry for both residential and commercial applications. Ruud has been designing water heaters for over 100 years; it started with the first automatic water heater and today the company offers a variety of tank and tankless type heaters. The core of Ruud hot water heaters are the gas and electric appliances for heating potable water, but the company also offers solar, high efficient and hybrid models. Ruud gas water heaters are designed in sizes from 28 to 150 gallons, all using the propane and natural gas, and based on how products of combustion are removed, direct, power and atmospheric vented systems are used. Ruud also manufactures high-efficient models and models with the powered damper, all having the high energy factor and reduced energy losses. Most of the gas-powered Ruud hot water heaters have the Guardian System, a system that incorporates the FVIR protection for additional safety. In our review, you will find units with the basic features such as the pilot light and simple gas valve, while more advanced heaters come with the fan assisted venting system, eco gas burners, hot surface ignition, self-cleaning system and gas valve with the electronic control and self-diagnostic system. Ruud electric-powered water heaters are designed as the conventional, tank-type that comes in different capacities, and more or less advanced features. Some are built as the economy, for budget-oriented families, some tough for professionals and demanding homes. Most of the electric units are made for the whole-house heating of potable water, while there are several models for point-of-use applications and special use. And the selection is great; from small 2.5 gallons to the large 120 gallons that provide enough hot water to homes with multiple bathrooms. Ruud electric, as the gas models, also feature self-cleaning system and high efficient water heating but are not Energy Star compliant. The only model which is designed with the ultra-efficiency is the hybrid type, and Ruud has it. Ruud hybrid water heaters come with the energy factor of 2.45 and this is accomplished by utilizing the heat pump technology. Ruud hot water heaters are, as opposed to the tank-type, designed with the tankless technology where water is heated on demand with an endless supply of hot water. Ruud offers two sizes, for indoor and outdoor installation. Tankless units are compact and small, installed on the wall, saving you precious floor space. 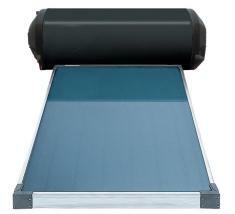 Indoor units are direct vented while the outdoor are vent-less but using the electric blower. Ruud tankless water heaters are also ultra-efficient and Energy Star compliant, as they are using the condensing technology for increasing the efficiency of over 90%. Built-in smart features help its users easy monitoring and convenient troubleshooting. Ruud solar water heaters are using the free solar energy so you can save on energy, on water heating costs and help in protecting the environment. These solar heaters come in two configurations, both found as the closed loop passive systems that don't require pumps or controllers. Ruud also offers solar water tanks that incorporate the electric heating elements and heat exchanger for direct and indirect water heating. Ruud Company was founded by Edwin Ruud who developed the first automatic, tank-type, gas-powered water heater, over a hundred years ago. In 1959 Rheem Manufacturing Company, which is now a subsidiary of Paloma Industries, bought the Ruud Company, but the water heaters are still produced and sold under the Ruud brand name.